Our instructional program offers classes that provide an introduction to non-competitive gymnastics. Our students learn all aspects of the traditional Olympic events, as well as, conditioning, flexibility and trampoline. This training allows for movement into the developmental program geared toward competitive training if desired. Our instructors will continue to focus on life skills, as well as gymnastics skills, to help their students be the best that they can be. 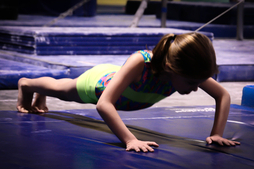 This class is specifically tailored for the beginning girl gymnast. Gymnasts will be introduced to the basic core skills of gymnastics on all women’s Jr Olympic events (vault, uneven bars, balance beam, high bar, and floor exercise) along with trampoline, stretching techniques and strength conditioning. 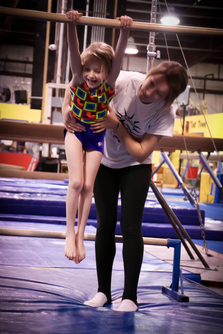 We believe that fun enhances the learning curve and will incorporate challenges and activities that will make your gymnast smile while progressing to the next level. Gym Motion’s intermediate level is divided into girls and boys classes to allow focus on the appropriate Jr Olympic event. This level will further build on the core skills already present and will require increased strength, flexibility and endurance. Proper skill execution will be emphasized to promote safety and upward progression. Trained staff will provide ample opportunity for exploration and fun while teaching proper form and technique that allows progression. At this level the gymnast has mastered some skills, increased their strength and flexibility, and has a proven ability in the sport. Skill aquistion has become more important and our trained staff utilizes challenges and goal setting to achieve success. Training is becoming more structured and we believe that fun is no longer in play, but in skill achievement activities that foster growth. This is the most advanced recreational gymnastics class offered at Motion Matrix. Gymnasts will have the opportunity to challenge their ability in a program where the sky is the limit! Gymnasts will follow proper progressions to safely achieve advanced level skills at their own pace. Proper skill execution is strongly emphasized in a fun enriching atmosphere to ensure success. Call for current schedule & to help us determine which class your child will excel in!